On the two plots in the left column, you can see the rho vs delta plots (see [Rodriguez et Laio, 2014]). Top plots shows the centroids that have been selected, and bottom plots shows in red all the putative centers that were considered by the algorithm. On the 4 plots on the rights, this is a 3D projection of all the spikes collected by that electrode, projected along different axes: x vs y, y vs z and x vs z. 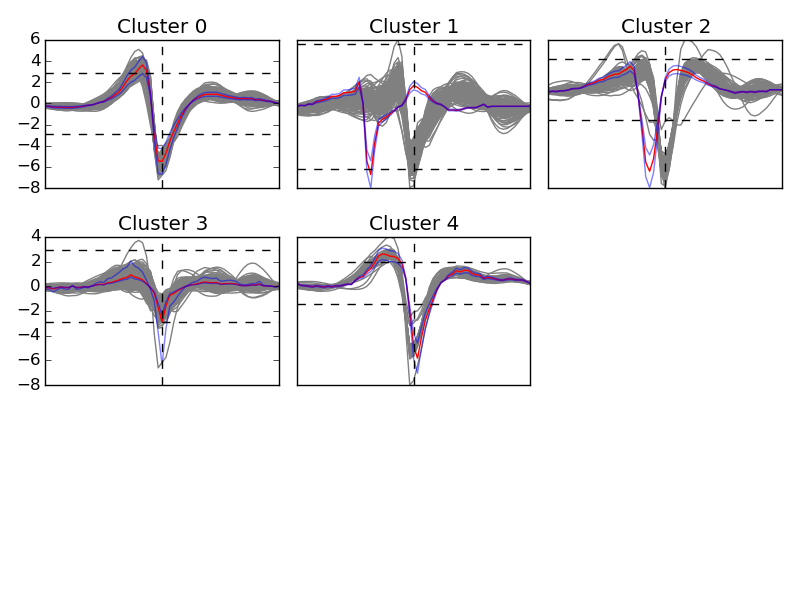 If, in those plots, you see clusters that you would have rather split, and that do not have different color, then this is likely that the clustering algorithm had wrong parameters. Remember that in the configuration file max_clusters controls the maximal number of clusters per electrodes that will be searched (so you may want to increase it if clustering is not accurate enough), and that sim_same_elec will control how much similar clusters will be merged. So again, decrease it if you think you are losing some obvious clusters. 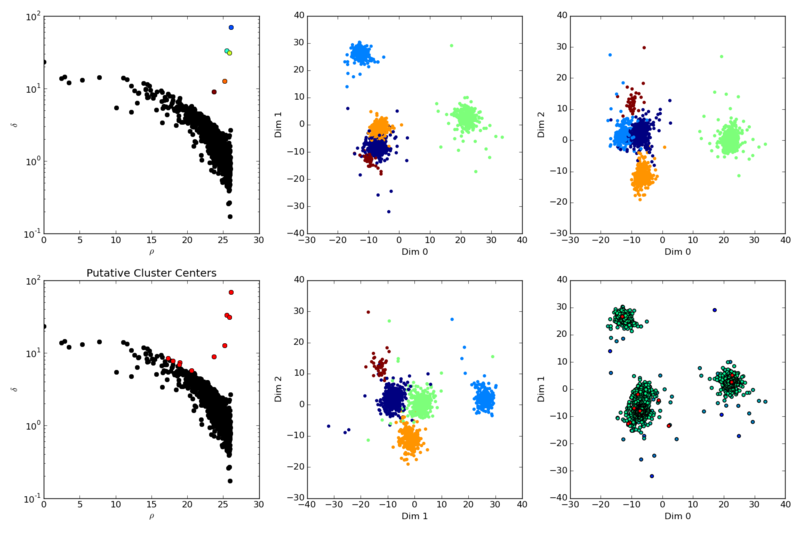 On this plot, you should get an insight on the templates that have been computed out of the clustering phase. For all the clusters detected on that given electrode, you should see all the waveforms peaking on that particular electrode, and the template, in red (in blue, this is the min and max amplitudes allowed during the fitting procedure). Note that if template is not aligned with the waveforms, this is normal. The templates are aligned on the electrodes were they have an absolute min. Here you are just looking at them on a particular electrode. The key point is that, as you can see, templates should all go below threshold on that particular electrode (dash-dotted line).